Background: Treatment of teeth affected with molar incisor hypomineralization (MIH) in young patients is challenging due to chronic subclinical pulpal inflammation caused by porous enamel and exposed dentin. Hypersensitivity of the teeth and difficulty in achieving local anesthesia due to altered nerve potential affects the successful completion of the treatment. Aim: The aim of the study was to compare the anesthetic efficacy of the intraosseous (IO) anesthetic technique with conventional local infiltration technique in anesthetizing first permanent molars (FPMs) affected by MIH for restorative procedures in children. Materials and Methods: This randomized controlled clinical trial recruited 54 MIH-affected mandibular or maxillary FPMs requiring restorations or stainless steel crowns. The teeth were randomly allocated to two equal groups to receive either IO injection or buccal infiltration (control), both using 4% articaine. Onset, time required, and pain experienced for administration, need for repeat, efficacy of anesthetic technique, heart rate, and postoperative complications were recorded in both the groups. Collected data were subjected to statistical analysis. Results: Onset was significantly faster and pain experienced during administration was significantly lower with IO technique. Need for repeat of anesthesia was significantly more with infiltration (44.4% vs. 7.4% in IO, P = 0.004). Local infiltration failed to produce profound anesthesia in 74.1% MIH-affected teeth. IO anesthesia profoundly anesthetized 88.9% MIH-affected teeth. Anesthetic efficacy was significantly better with IO anesthesia (P < 0.001). Postoperative complications were significantly lower with IO anesthesia (P = 0.003). Conclusion: IO local anesthesia was found to be an effective and safe technique to achieve profound anesthesia in MIH-affected teeth in children in comparison to local infiltration. The term molar incisor hypomineralization (MIH) was defined by Weerheijm et al. as hypomineralization of systemic origin of one or four permanent first molars frequently associated with affected incisors., Worldwide, prevalence of MIH ranges from 2.4%–40.2%, while in India, it is reported to be in the range of 0.48%–14.9%.,,,,,,,, MIH-affected teeth are characterized by rapid posteruptive breakdown and associated caries. Clinical management of young patients with MIH-affected teeth becomes challenging due to chronic subclinical inflammation caused by ingress of bacteria in the exposed dentin, sensitivity and rapid caries development in the affected teeth, difficulty in achieving local anesthesia as a result of altered nerve potential, and limited cooperation of the young child due to hypersensitivity-related apprehension. Failure in achieving profound anesthesia can lead to behavior management problems in already anxious children and affect the quality of restorations. In some situations, a clinician might be tempted to use a greater dose of anesthetic solution to overcompensate for the hyperresponsive tooth. In children, since the dose of anesthetic solution is limited by age and weight, a practitioner might reach the maximum dose before the desired effect is achieved. This emphasizes the need for promising local anesthetic technique that ensures profound anesthesia for treatment of MIH-affected teeth. Intraosseous (IO) anesthesia has recently gained attention in the field of endodontics. Studies in adults have shown higher failure rates of conventional nerve blocks in teeth with irreversible pulpitis. Barring one study, there is a scarcity of published literature evaluating anesthetic efficacy of IO anesthesia for treatment of MIH-affected teeth in children. The aim of this study was to compare the anesthetic efficacy of the IO local anesthetic technique with conventional infiltration technique for restorative treatment of permanent molars affected by MIH in children between age 8 and 14 years. This randomized controlled, two-arm, clinical trial was conducted in the Department of Pedodontics and Preventive Dentistry with the approval of the Institutional Ethical Committee. The study was conducted in accordance with the Helsinki Declaration of 1975, as revised in 2000. Informed consents were obtained from parents who agreed to allow their children to participate in the study. A pilot study was performed on 12 teeth from six patients, and sample size was determined according to the proportions of efficacy scale (primary outcome) available from the pilot study. These participants were not included in the study sample. The sample size was calculated to give a standard error of 5% with a confidence interval of 95% and a power of 80%. Using these calculations, the minimum sample needed in each group to detect a significant difference between the two groups was 25 children. A total of 60 first permanent molars (FPMs) affected with MIH and requiring restorations or stainless steel crowns from 32 healthy patients between age 8 and 14 years were initially selected for this study. EAPD diagnostic criteria were used for the diagnosis of MIH. Children who were on regular medications for any illness and molars with chronic irreversible pulpitis or periradicular pathosis requiring endodontic procedures were excluded from the study. Molars with roots in close proximity to the erupting succedaneous tooth bud of the adjacent primary molar were also excluded. Parents of three children (six teeth) refused to be included in the study. Therefore, the final sample for the study included a total of 54 mandibular or maxillary FPMs affected with MIH from 29 children. Severity of MIH of all the included teeth was evaluated using the modified Wetzel and Reckel scale. Group IO (treatment group): IO local anesthetic technique (n = 27). Children in this group were administered 1.5 ml of 4% articaine with 1:100,000 epinephrine (Septanest, Septodont ®, France) by conventional buccal infiltration local anesthetic technique with a 27-gauge short needle before restorative procedure. Topical anesthetic gel (Precaine, Pascal International, USA) was applied before infiltration. In case of failure of adequate anesthesia, the procedure of buccal infiltration was repeated. Children in this group received IO local anesthesia with X-tip ® IO system (X-tip ® Intraosseous Anesthetic Delivery System, Dentsply Maillefer, USA). A preoperative radiograph was taken to ascertain that the proposed injection site had adequate room to accommodate the X-tip ® drill and guide sleeve between the adjacent roots. After applying the topical anesthetic gel (Precaine, Pascal International, USA), buccal mucosa was anesthetized first with infiltration of 0.5 ml of 4% articaine with 1:100,000 epinephrine using a 27-gauge ultra-short needle. After the buccal mucosa was satisfactorily anesthetized, a site was marked 2–4 mm below the alveolar crestal level, immediately mesial of the tooth to be treated, using a straight probe. In cases where the penetration was difficult, a distal site was selected. The guide sleeve along with a perforator tip was then attached to the slow speed handpiece with speed of 15,000–20,000 rpm [Figure 1]. Holding the drill at 90° angle to the point marked on the gingiva, the perforator tip was pushed and withdrawn in a forward and slow pecking motion using light pressure until a break-through feeling was felt or the tip penetrated completely in the cancellous bone. The perforator tip was then separated, and the guide sleeve was secured in place using a mosquito forceps or tweezers. A metal syringe loaded with X-tip ® 27-gauge ultra-short needle was inserted into the guide sleeve and 0.7 ml of 4% articaine with 1:100,000 epinephrine was slowly delivered in the cancellous bone. 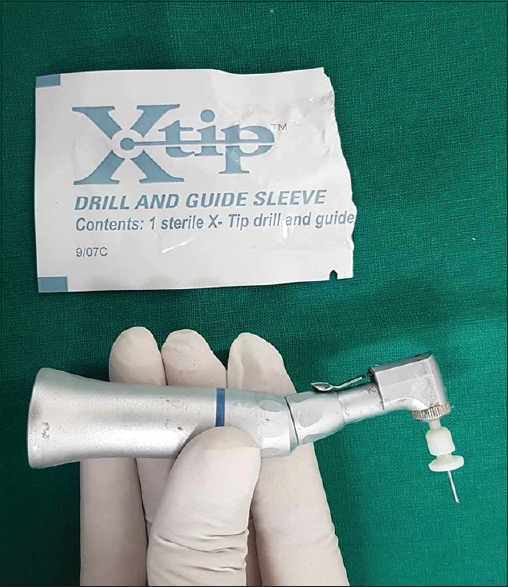 In case of failure of adequate anesthesia, local anesthetic solution was administered through the guide sleeve, which was secured in place throughout the procedure [Figure 2]. Time required for administration of local anesthesia from application of topical anesthesia to local anesthetic delivery was recorded by an assistant. Pain during administration was evaluated using a modified behavior pain scale by Taddio et al. Child's reaction to pain was evaluated as the presence or absence of arm or leg movements, torso movements, oral physical resistance (like resistance or hesitation in opening mouth when asked), and crying. Face was observed for brow raising and eye squeeze. The presence of these reactions was scored as 1 and absence was scored 0. The scores were then added to obtain a behavior pain scale score for each patient, higher score indicating worse behavior due to pain. Onset of anesthesia was judged by subjective and objective symptoms with the use of probing and air spray on the affected tooth at 5, 10, 30, and 60 s intervals. The need for repeat anesthesia was recorded as yes or no. 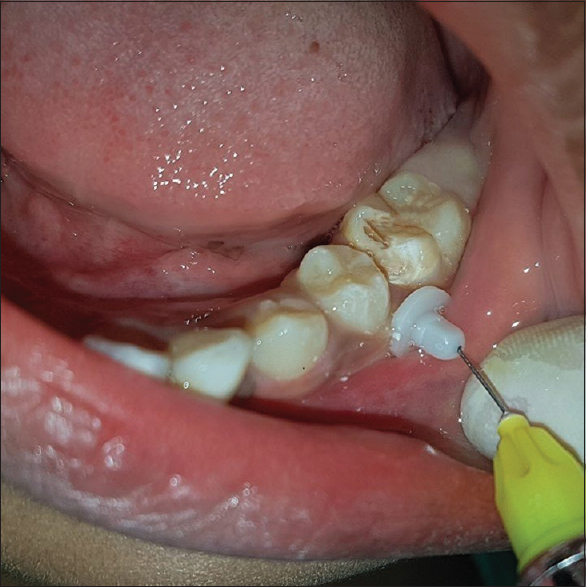 Efficacy of local anesthetic technique to complete the restorative procedure successfully without pain was evaluated by efficacy scale as given by Sixou and Barbosa-Rogier. Each tooth was assigned a score according to this scale by a senior pediatric dentist at the end of the procedure. Heart rate of the child was recorded using pulse oximeter at four different time intervals during the treatment procedure, namely, preoperative, during local anesthetic administration, during restoration, and 10 min postoperatively. Information regarding postoperative complications including lip/cheek biting, swelling, pain, or local infection was obtained. The presence of each sign or symptom received a score of one. All these scores were added to obtain a postoperative complication score for each patient, higher score indicating more complications. Statistical comparison of various recorded parameters between the groups was performed using appropriate statistical test designed for categorical or continuous variables using SPSS 15 software (SPSS Inc., Chicago, IL, USA). Significance was set at P < 0.05. Distribution of the sample according to the age and gender of patients included teeth selected, MIH severity scores of the teeth included, and the type of restorative procedures performed under local anesthesia was uniform across the two groups as presented in [Table 1]. 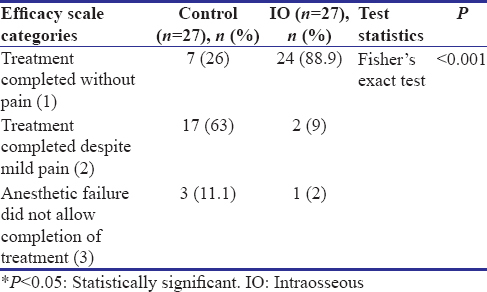 IO technique required significantly more time for administration and showed significantly faster onset as compared to the infiltration technique [Table 2]. In the Control group, 44.4% teeth required repeat of anesthetic administration due to the failure of achieving adequate anesthesia. The difference between the two groups was found to be statistically significant [P = 0.004, [Table 2]. Behavior pain score during the administration of local anesthetic solution was found to be significantly lower in the IO group (0.93 ± 1.0) than in the control group (1.96 ± 1.32, P = 0.002), indicating less pain during IO administration. 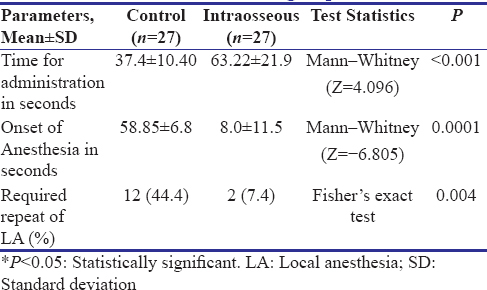 Statistical significant differences were found in local anesthetic efficacy between the two local anesthetic techniques used [P < 0.001, [Table 3]. In most of the children (89%) in the IO group, the restorative treatment was completed without pain, whereas in most of the children (63%) from the control group, the restoration was completed with mild pain. Heart rate increased during administration of local anesthesia in both the groups (control: 77.7 and IO: 78.2). In the control group, it increased further to 80.3 during restorative treatment; however, in the IO group, it remained stable at 78.3. Mean baseline heart rate of children measured preoperatively was found to be 73.1 in the control group and 73.6 in the IO group. Two-way ANOVA with repeated measures performed on the data revealed a significant effect of time (F = 14.774, P < 0.001); however, the differences between the groups were not significant (F = 0.476, P = 0.49). Combined effect of group and time on heart rate was found to be not significant (F = 1.052, P = 0.378). Postoperatively, none of the children in both the groups showed lip/cheek biting, swelling, or infection at the site of injection. Fifteen patients in the control group and two patients in the IO group reported postoperative pain. Mean postoperative complication score in the control group was 0.51 ± 0.57, while in the IO group was 0.11 ± 0.32. The difference between the two groups was statistically significant (P = 0.003). To the best of our knowledge, this study is the only randomized controlled trial that has evaluated anesthetic efficacy of IO anesthetic technique with 4% articaine in anesthetizing MIH-affected molars for restorative procedures. We decided to restrict our selection to MIH-affected teeth indicated for restorative procedures, as we aimed at studying effective anesthesia in teeth with inflamed vital pulp. The choice of anesthetic used was 4% articaine with 100,000 adrenaline. Profound anesthesia with articaine is attributed to the presence of thiophene ring  and higher fat solubility. Buccal infiltration with 4% articaine has been shown to be as effective as inferior alveolar nerve block with 2% lignocaine. Earlier studies have reported some discomfort with IO administration which was attributed by the authors to feeling of injecting the solution rather than pain.,, Interestingly, in our study, more children in the control group (24 as against 16 in the IO group) complained of pain during administration. This could be related to injecting a higher volume of local anesthetic solution in the infiltration technique. Assessment of local anesthetic efficacy was the primary outcome of our study. Our results undoubtedly showed that IO technique was significantly better in anesthetizing MIH-affected teeth so that planned restoration could be completed without pain as compared to the buccal infiltration. IO anesthetic technique performed in children with primary teeth reported success rates of 96.6% in endodontic treatment, 100% in restorative procedures, and 88% in extractions; while in permanent teeth, the success rates ranged from 92.3% in endodontic treatment, 89.9% in restorative procedures, and 75% in extractions. Our finding of increase in the heart rate during the administration of IO anesthesia is similar to most other studies.,,, Such an increase in the heart rate has been attributed to faster entry of catecholamines in the vascular system when using IO route. However, in our study, buccal infiltration also caused comparable increase in the heart rate. Mean heart rate, measured during the restorative procedure, was found to be higher in the control group than in the IO Group. This may be mainly attributed to more profound anesthesia and painless treatment with IO anesthetic technique. Another reason could be the dose of epinephrine delivered to children in the control group was higher as compared to that in the IO Group, as volume delivered was higher. IO anesthesia is a technique-sensitive procedure. In two patients from the IO Group, we were not able to penetrate the bone at the first instance, one patient requiring one more attempt and the other requiring two more attempts for successful penetration. Both the teeth were mandibular first molars from different children. Difficulty in penetration with IO technique has been reported earlier., This can either be due to greater thickness of the compact bone in the area of injection site or wrong site selection by the operator., However, in children, the incidence of this complication might be less frequent due to lesser bone density as compared to adults. Various other complications such as backflow of the solution in the oral cavity,,, dizziness, perspiration and weakness in legs, separation of the perforator tip from the guide sleeve shank, wrong selection of the needle size in perforator hole by the operator,, or breakage of the perforator tip  are also reported as possible difficulties with IO technique. We did not find any such complications in our study. Our finding revealed that postoperative complications with IO anesthesia were significantly lesser than with the infiltration technique. Only comparative study available in the literature studying postoperative complications of IO anesthesia was by Peñarrocha-Oltra et al. They reported postoperative pain at injection site in IO technique as compared to inferior alveolar nerve block. Other complications such as mild numbing of lips/cheeks,,, postanesthetic bite, delayed healing at the perforator site, or focal osteonecrosis secondary to excessive heat generated due to prolonged rotation of the perforator drill  have been reported in the literature. None of the above complications were observed in our study. This study has a few limitations. We could not evaluate the effectiveness of the two local anesthetic techniques in the maxillary and the mandibular teeth separately. Since maxillary alveolar bone is more porous, profound anesthesia could be achieved solely by infiltration technique. A similar study conducted with split-mouth technique will have more control over patient-related factors. Our study suggests that IO local anesthesia is an effective and safe technique to achieve profound anesthesia in MIH-affected teeth with severe hypersensitivity related to chronic pulpal inflammation in children. Weerheijm KL, Jälevik B, Alaluusua S. Molar-incisor hypomineralisation. Caries Res 2001;35:390-1. Weerheijm KL. Molar incisor hypomineralisation (MIH). Eur J Paediatr Dent 2003;4:114-20. Jälevik B. Prevalence and diagnosis of molar-incisor- hypomineralisation (MIH): A systematic review. Eur Arch Paediatr Dent 2010;11:59-64. Parikh DR, Ganesh M, Bhaskar V. Prevalence and characteristics of molar incisor hypomineralisation (MIH) in the child population residing in Gandhinagar, Gujarat, India. Eur Arch Paediatr Dent 2012;13:21-6. Bhaskar SA, Hegde S. Molar-incisor hypomineralization: Prevalence, severity and clinical characteristics in 8- to 13-year-old children of Udaipur, India. J Indian Soc Pedod Prev Dent 2014;32:322-9. Mittal NP, Goyal A, Gauba K, Kapur A. Molar incisor hypomineralisation: Prevalence and clinical presentation in school children of the northern region of India. Eur Arch Paediatr Dent 2014;15:11-8. Mittal N, Sharma BB. Molar incisor hypomineralisation: Prevalence and defect characteristics in Indian schoolchildren. J Cranio Max Dis 2015;4:49-56. Yannam SD, Amarlal D, Rekha CV. Prevalence of molar incisor hypomineralization in school children aged 8-12 years in Chennai. J Indian Soc Pedod Prev Dent 2016;34:134-8. Subramaniam P, Gupta T, Sharma A. Prevalence of molar incisor hypomineralization in 7-9-year-old children of Bengaluru city, India. Contemp Clin Dent 2016;7:11-5. Krishnan R, Ramesh M, Chalakkal P. Prevalence and characteristics of MIH in school children residing in an epidemic fluorosis area of India: And epidemiological study. Eur Arch Paediatr Dent 2015;16:455-60. Anjum R, Sudhan ZA. The prevalence of molar incisor hypomineralisation (MIH) in a group of children coming to Indira Gandhi Govt. dental college, Jammu. Int J Clin Cases Invest 2015;6:140-5. Kirthiga M, Poornima P, Praveen R, Gayathri P, Manju M, Priya M, et al. Prevalence and severity of molar incisor hypomineralization in children aged 11-16 years of a city in Karnataka, Davangere. J Indian Soc Pedod Prev Dent 2015;33:213-7. Fagrell TG, Lingström P, Olsson S, Steiniger F, Norén JG. Bacterial invasion of dentinal tubules beneath apparently intact but hypomineralized enamel in molar teeth with molar incisor hypomineralization. Int J Paediatr Dent 2008;18:333-40. William V, Messer LB, Burrow MF. Molar incisor hypomineralization: Review and recommendations for clinical management. Pediatr Dent 2006;28:224-32. Rodd HD, Boissonade FM, Day PF. Pulpal status of hypomineralized permanent molars. Pediatr Dent 2007;29:514-20. Jälevik B, Klingberg GA. Dental treatment, dental fear and behaviour management problems in children with severe enamel hypomineralization of their permanent first molars. Int J Paediatr Dent 2002;12:24-32. Discepolo K, Baker S. Adjuncts to traditional local anesthesia techniques in instance to hypomineralized teeth. N Y State Dent J 2011;1:22-6. Cabasse C, Marie-Cousin A, Huet A, Sixou JL. Computer-assisted intraosseous anaesthesia for molar and incisor hypomineralisation teeth. A preliminary study. Odontostomatol Trop 2015;38:5-9. Preusser SE, Ferring V, Wleklinski C, Wetzel WE. Prevalence and severity of molar incisor hypomineralization in a region of Germany – A brief communication. J Public Health Dent 2007;67:148-50. Taddio A, Nulman I, Koren BS, Stevens B, Koren G. A revised measure of acute pain in infants. J Pain Symptom Manage 1995;10:456-63. Sixou JL, Barbosa-Rogier ME. Efficacy of intraosseous injection of anesthetic in children and adolescents. Oral Surg Oral Med Oral Pathol Oral Radiol Endod 2008;106:173-8. Oertel R, Rahn R, Kirch W. Clinical pharmacokinetics of articaine. Clin Pharmacokinet 1997;33:417-25. Tom K, Aps J. Intraosseous Anesthesia as a primary technique for local anesthesia in dentistry. Clin Res Infect Dis 2015;2:1-9. Bartlett G, Mansoor J. Articaine buccal infiltration vs lidocaine inferior dental block-a review of the literature. Br Dent J 2016;220:117-20. Sixou JL, Marie-Cousin A, Huet A, Hingant B, Robert JC. Pain assessment by children and adolescents during intraosseous anaesthesia using a computerized system (QuickSleeper). Int J Paediatr Dent 2009;19:360-6. Bigby J, Reader A, Nusstein J, Beck M, Weaver J. Articaine for supplemental intraosseous anesthesia in patients with irreversible pulpitis. J Endod 2006;32:1044-7. Verma PK, Srivastava R, Kumar MR. Anesthetic efficacy of X-tip intra-osseous injection using 2% lidocaine with 1:80,000 epinephrine in patients with irreversible pulpitis after inferior alveolar nerve block: A clinical study. J Conserv Dent 2013;16:162-6. Replogle K, Reader A, Nist R, Beck M, Weaver J, Meyers WJ, et al. Cardiovascular effects of intraosseous injections of 2 percent lidocaine with 1:100,000 epinephrine and 3 percent mepivacaine. J Am Dent Assoc 1999;130:649-57. Peñarrocha-Oltra D, Ata-Ali J, Oltra-Moscardó MJ, Peñarrocha-Diago M, Peñarrocha M. Side effects and complications of intraosseous anesthesia and conventional oral anesthesia. Med Oral Patol Oral Cir Bucal 2012;17:e430-4. Lilienthal B, Reynolds AK. Cardiovascular responses to intraosseous injections containing catecholamines. Oral Surg Oral Med Oral Pathol 1975;40:574-83. Stabident; 2017. Available from: http://www.stabident.com/initial-step.html. [Last accessed on 2017 Oct 11]. Available from: http//www.maillefer.com/wp-content/uploads/2015/07/Maillefer-X-Tip-DFU.pdf. [Last accessed on 2017 Oct 11]. Reisman D, Reader A, Nist R, Beck M, Weaver J. Anesthetic efficacy of the supplemental intraosseous injection of 3% mepivacaine in irreversible pulpitis. Oral Surg Oral Med Oral Pathol Oral Radiol Endod 1997;84:676-82. Nusstein J, Kennedy S, Reader A, Beck M, Weaver J. Anesthetic efficacy of the supplemental X-tip intraosseous injection in patients with irreversible pulpitis. J Endod 2003;29:724-8. Coggins R, Reader A, Nist R, Beck M, Meyers WJ. Anesthetic efficacy of the intraosseous injection in maxillary and mandibular teeth. Oral Surg Oral Med Oral Pathol Oral Radiol Endod 1996;81:634-41. Idris M, Sakkir N, Naik KG, Jayaram NK. Intraosseous injection as an adjunct to conventional local anesthetic techniques: A clinical study. J Conserv Dent 2014;17:432-5. Razavian H, Kazemi S, Khazaei S, Jahromi ZM. X-tip intra-osseous injection as a primary anesthesia for irreversible pulpitis of posterior mandibular teeth: A randomized clinical trial. Dent Res J 2013;10:210-3. Woodmansey KF, White RK, He J. Osteonecrosis related to intraosseous anesthesia: Report of a case. J Endod 2009;35:288-91.